MONTGOMERY, Ala. (AP) — Visitors to the new National Memorial for Peace and Justice first glimpse them, eerily, in the distance: Brown rectangular slabs, 800 in all, inscribed with the names of more than 4,000 souls who lost their lives in lynchings between 1877 and 1950. Each pillar is 6 feet (2 meters) tall, the height of a person, and made of steel that weathers to different shades of brown. Viewers enter at eye level with the monuments, allowing a view of victims’ names and the date and place of their slaying. As visitors descend downward on a slanted wooden plank floor, the slabs seemingly rise above them, suspended in the air in long corridors, evoking the image of rows of hanging brown bodies. There is one column for each of the 800 U.S. counties where researchers uncovered lynchings. Most of the roughly 4,400 killings happened in the South, but states coast-to-coast are represented. Bryan Stevenson, the founder of the Equal Justice Initiative, said he wanted to create a space for people to confront and “deal honestly with this history,” just as South Africa has sites about apartheid and Germany memorializes victims of the Holocaust. “We don’t have many places in America where we have urged people to look at the history of racial inequality, to look at the history of slavery, of lynching, of segregation,” said Stevenson, who is black. The memorial opens the same week that Alabama marks Confederate Memorial Day, an official state holiday in which state offices will close. The first installation visitors see up close comprises statues of six slaves with chains around their necks, lash marks on their backs. A mother, face twisted in horror, cradles an infant in one arm and stretches out her other hand reaching for something, or someone, outside her grasp. Relatives of Thomas Miles Sr., a black business owner lynched in Shreveport, Louisiana in 1912, visited the site Monday. First they visited the museum, where dirt taken from the site of several lynchings, including Miles, is displayed. Then they stopped by the memorial. “I was crying. I felt anger. I felt frustration. I wanted to talk. I wanted to be quiet. There were so many emotions,” said Shirah Dedman, who grew up knowing only that her great grandfather was lynched and that her family had fled the South because of it. Other descendants of victims want to hope to make the trip to Alabama to see the memorial. 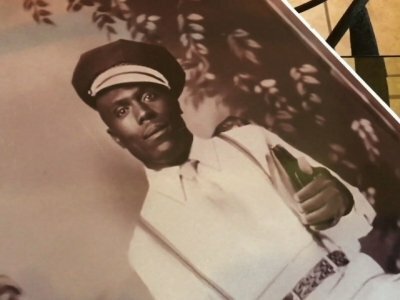 Caldwell Washington, 23, was found hanging from a tree in 1933 in what authorities in Taylor, Texas, first called a suicide. But family members and supporters say the finding overlooked a key fact: his hands were tied behind his back. Washington’s granddaughter, Johnnye Patterson, said the family was gratified to learn that Washington’s name is included on the memorial as a lynching victim. That’s particularly true for Patterson’s mother, Johnnye Mae Washington Patterson, who was Washington’s daughter and has lived with a lifetime of pain. “They didn’t ever believe he committed suicide. It didn’t make sense that you find someone hanging in a tree with his hands tied behind him,” Johnnye Patterson said. The museum accompanying the memorial is called Legacy Museum: From Enslavement to Mass Incarceration. It is located on the site of a former slave depot in downtown Montgomery, and seeks to explore slavery’s legacy. “You are standing on a site where people were warehoused,” announces a statement written on the first wall visitors see as they enter. Down a dark hallway, images of talking slaves are projected on walls behind cell bars. The first is of a woman who is pleading for the children who were taken away from her. The museum explores the eras of enslavement, lynching, Jim Crow to mass incarceration and modern criminal justice issues that are the focus of the Equal Justice Initiative’s legal work. Several of the organization’s clients are featured, including Ray Hinton, a man whose conviction was overturned after 30 years on Alabama’s death row. Stevenson, who works with death row inmates, has had judges presume he is a defendant when he sits at the defense table. He doesn’t believe that slavery disappeared but “evolved.” He said what he means by that is the myth of white supremacy that was created to justify slavery didn’t disappear in 1865. Stevenson said Monday that he expects that some people will be “uncomfortable” by the new memorial and museum, noting the organization got pushback a few years ago when they erected the first historical markers in downtown Montgomery to mark the sites of slave markets. AP writer Jay Reeves in Montgomery, Alabama, contributed to this report.